This is the first time I’ve used levulose so I thought I’d start simple with these Coconut Cookies flavoured with ginger, cinnamon, and cardamom. Levulose is a natural, low GI (19) form of fructose. It is sold in India under the label Diabetics Dezire. It does not have any unpleasant aftertaste. However, since levulose is in fact a type of sugar, diabetics must take this into account while consuming it. Levulose is metabolised by the liver and not the pancreas and therefore not dependent on insulin. However, some suggest that excess consumption may lead to insulin resistance, which is what ails Type-2 diabetics. So, as always, enjoy in small quantities only. 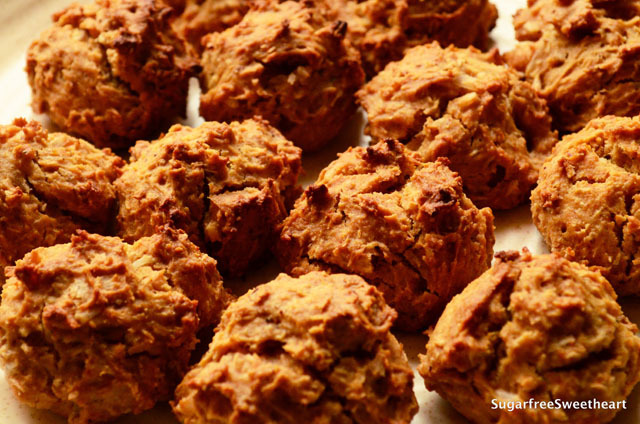 Don’t gobble up all of these just because they’re made with whole wheat, coconut, and low GI sweetener! Heh. These cookies are crunchy-outside, soft-inside. The ginger, cardamom, and cinnamon give them a lovely masala chai smell and, of course, the house smells lovely as these are baking! This recipe is suitable for diabetics, weight-watchers, and masala chai appreciators! Levulose is 1.7 times sweeter than sugar so I used 3/4th the amount of sugar that would be needed. I used only 1 tbsp of ginger and it was lost in the coconut flavour. So I recommend 3 tbsp in the recipe. If you are tweaking the quantities ensure you have enough ground ginger to cut through the whole wheat and coconut. While I don’t have any experience cooking with coconut blossom sugar, I guess it could be used as a substitute for levulose as it is also a low GI sweetener. As always, consume in small quantities! I already love your ingredient list so i must love these lovely cookies! 🙂 They look adorable & quite impressive too! I am on the hunt for this levulose now! They’re also quite easy! I think it’s pretty much the same sort of sweetener as coconut blossom sugar but I’m not sure of the equivalency/sweetness factor of coconut sugar as compared to sugar. I will look out for it! thanks! Although I am not diabetic, I must try these cookies. I do not eat dairy, so I appreciate the olive oil in place of butter. I will probably try to make these with a stevia/sugar mix. Olive oil also helps the cookies stay soft though they wont rise as much as with butter. Happy baking!